Continuing our ongoing look at the history behind anti-online poker activist James Thackston, the poker world learned this week that Thackston spent years trying to lobby Harrah’s Entertainment (now Caesars Entertainment) and other major gambling and entertainment firms to buy his software products. Among several explosive releases of information by Poker Players Alliance veep Rich Muny this week was an e-mail exchange between Thackston and Harrah’s exec Jan Jones and Gary Loveman. In a Facebook post titled, “***** JIM THACKSTON’S EXPLOSIVE, TREACHEROUS EMAILS TO CAESARS’/HARRAH’S JAN JONES! *****”, Muny illustrated the “treacherous, deceitful nature of “Benedict Thackston,” who had sought to sell to Harrah’s and other companies Thackston’s own version of identity-security software. Thackston pitched what he referred to as his “eSAFE” project, which was themed to correlate with a bill which had been introduced in Congress in September of 2006. No, it wasn’t the Unlawful Internet Gambling Enforcement Act (UIGEA), which was passed that same month, but another bill, H.R. 6299, the Protecting Our Children from Age-Restricted Internet Products and Services Act of 2006, also known (at least by Thackston) as “eSAFE” for short. This other bill, which made barely a blip in online poker circles, was introduced by U.S. Rep. Chip Pickering (R-MS), and co-sponsored by one of online poker’s most famous Bible-thumping foes, Spencer Bachus (R-AL). It eventually died in committee. 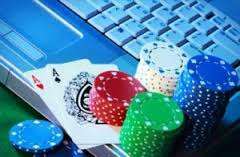 at which time Thackston and his backers pinned some of their hopes on a later, 2007 bill, the HR2140 “Internet Gambling Study Act” introduced by pro-gaming Nevada US Rep. Shelley Berkley. We’ll return to these bills and Thackston’s connections to them in the second half of today’s Thackston-themed double dip (with more to come early next week), but for now let’s just note that the late-2006 passage of UIGEA effectively killed half of a software-development business that Thackston had been working on since 2004. That’s where the story gets really interesting, though it breaks in several directions. The PPA’s Muny and yours truly have been in occasional contact over the past several days, not working together, but researching separate tangents related to Thackston and his curious past business dealings. Muny uncovered additional documents showing that in July of 2004, Thackston, a Florida resident, had partnered with several Florida-based poker pros to start up a firm called Concierge Holdings, Inc.
Bill Byers, the same old nitty pro who’s being put forth as the expert to show how Thackston’s nonsensical claims of giant-scale money-laundering could be done on regulated US poker sites, is shown to be a business partner of Thackston’s. As is Hilbert Shirey, a three-time WSOP bracelet winner. And who is Hilbert Shirey’s longtime poker and golfing friend? That would be Dewey Tomko, who wasn’t on this company’s board of directors but is likely involved as an investor in a successor company of Thackston’s, Privatas LLC, which was also incorporated last decade, appears to remain in existence today, and is the entity of choice of Thackston’s communications to Harrah’s execs back in 2007-08. I will be visiting Las Vegas from January 9-11 on other business if you want to meet to discuss anything beyond that summarized below. The Government has new information about a series of severe security faults in most internet poker websites. Harrah’s should immediately drop any notion of opening WSOP poker sites in non-US jurisdictions – it will not be a good business decision. I noticed that Gary Loveman is anticipating poker leglaization within 24 months. He is wrong. Internet poker will not become legal in the US within the next 10 to 15 years, if ever. The new (urgent) emphasis should be on preventing the UK, EU, and other governments from banning the activity. In the near future, expect the US Government to assume a more aggressive posture with respect to internet poker. Negative effects should be felt by the 2009 WSOP. The 2008 WSOP might not be affected. You asked me to keep you informed of the eSAFE child protection legislation. For the past 3 years, I have sought investment money from the internet poker industry to operate an internet payment processing company and to support the eSAFE legislation from that corporate entity. The most prominent targeted investors were Lyle Berman, Howard Lederer (Full Tilt), and Mitch Garber (Party Gaming). Because I failed to raise the necessary investment, I have shut down the eSAFE project as well as the company that supported it. Due to severe financial stress and with great anguish, I have been forced to take actions detrimental to the internet poker cause. Recently, I turned over my internet poker research material to Government security and law enforcement representatives. Be assured that they had never seen anything like what I gave them. I am considering taking a contract with the Government to assist US security agencies in shutting down internet poker websites, In such capacity, I may participate in security discussions with representatives of the UK, EU, and other governments. I will be in Las Vegas from January 9-11 for meetings related to the shut down of eSAFE. I can meet with you during this time. Thursday, January 10th is best since I can adjust my other meetings around your schedule. Please be aware that while I can explain some things in more detail, I am barred by the US Code from disclosing classified information. Specifically, information about the research material is off limits to anyone not having the appropriate clearance and need to know. Finally, please understand that my intentions have always been to help the industry and never to harm Harrah’s or any other gaming company. Poverty has forced me to seek a new path. Until I get back on a sound financial foundation, next week is the last trip I can afford to make to Vegas. Because I suspect that you, Mr. Loveman, and others either are or certainly will become upset by my actions, I want to explain exactly where any anger should be directed. It should not be directed at me. I have documents to show you that I cannot fax or send through the mail. Please let me know if you can meet next week. In Part 2, we’ll look at some of the lobbying efforts and other domain names involved at what was once a two-pronged software development envisioned by Thackston.